Blackpool chairman Karl Oyston insists he has "no regrets" about holding talks with other managers behind the back of boss Jose Riga. Oyston and Riga have had a fractious relationship since the Belgian was appointed in June. The Championship club has yet to win a match and Oyston held talks with Burton boss Gary Rowett about taking over. "I don't regret that because at the time it looked likely we would make a managerial change," said the chairman. Oyston was fiercely criticised by the fans and the media for attempting to lure Rowett before he had dismissed Riga. As it was, Rowett turned down the job offer and Riga has remained in charge. The relationship between manager and chairman, though, is fragile at best. Asked how the pair can rebuild bridges, Oyston told Football Focus: "I'm not sure it is rebuilding - building from the start is probably more accurate. "It is a results-based business, we all know that, and we haven't won any games. "We need to work better and more closely together because a manager-chairman relationship is the most single important at a football club, and if that is wrong, the club is bound to go only one way." "I think if we can put the spats and the stand-offs and all the other issues behind us and work better together, then absolutely he is the right man. If we can't, then no he clearly isn't and things will have to change." Blackpool were flying high in the Premier League only three years ago, but the club's fortunes have nose-dived since Ian Holloway quit in November 2012. Michael Appleton, Paul Ince and Barry Ferguson have since come and gone. Riga, 57, was appointed manager on the back of a 17-game spell at Charlton at the end of last season when he kept the club up. "We interviewed and employed Jose in the belief that he was a very good coach and motivator on the back of what he did at Charlton," said Oyston. "I still think now what I thought when I gave him the job - that he is a good coach and he will organise players well and definitely get the best from them. "I think if we can put the spats and the stand-offs and all the other issues behind us and work better together, then absolutely he is the right man. "If we can't, then no he clearly isn't and things will have to change." Blackpool's transfer business in the summer - or lack of - became headline news. The club had only eight contracted professionals two weeks before the season started and was forced to cancel a pre-season tour to Spain. Oyston admits the situation wasn't ideal but claimed he never panicked. He also explained why transfers were slow to happen. "Jose wanted specific players. They were from all over Europe and there were all sorts of mysteries attached to those that I had never come across before in my time in football," said the Seasiders chairman. "We can't make the same mistakes that other clubs have by putting money in Swiss bank accounts or sending players' wages to Greece so they can get it without paying tax. "If that means we faltered or didn't manage to land players, that was a price we were happy to pay. "Jose, on the other hand, didn't really care about the peripheral issues you have to deal with. Like most managers he just wanted the player, so there were going to be issues." Oyston added: "Eight players, two weeks to go - it was a great soundbite. "As I once famously said to Ian Holloway, it is all about holding your nerve. Ian actually rang me a week before the season started and said 'you've held your nerve better than ever before'. "I always knew we'd get the players and we did get the players - but obviously I think we've paid the price for that lack of preparation at the start of the season." Oyston has been chairman at Bloomfield Road since 1998; his father Owen has owned the club since the mid 80s. Fans have regularly complained about the family's involvement with the club, especially in the last 12 months, but Oyston claims he is never affected by the protests that have been a feature of his tenure. "It amazes me when I see people who run other clubs that are quite hurt by it and don't understand why people are being horrible to them," he said. "If the team is going well then the manager is wonderful. If the team is going badly then the chairman is a sod. Just accept that or don't be in football." Blackpool have one point from seven league games and were dumped out of the Capital One Cup by League Two Shrewsbury. "It's not about money. The wage bill this year is higher than the year we got promoted to the Premier League," he said. "The team below us (Fulham) have a wage bill in the mid-£30m region and spent £11m on a player this summer. Go and ask them if they think spending money is the answer to it all. "We will recruit more players, but however many players you've got and whatever the team is like, people always say you just need that little bit more. "I am proud that I've taken a 'basketcase' of a club from near the bottom of League Two to the Championship for the first time in 30 years and into the Premier League. "All the fans, and myself, want to see a winning team and for us to move up that league. "I don't mind spending money, but we've got to make sure we spend money more effectively than we have." 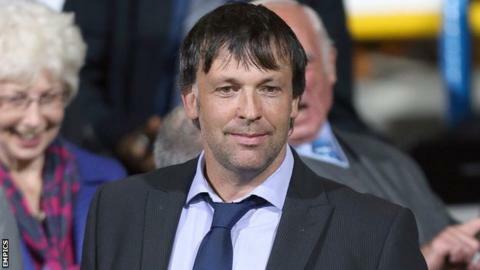 Football Focus, featuring an interview with Karl Oyston, is on BBC One on Saturday, 20 September at 12:10 BST.